It really is rather sad and pathetic. Tell it to youtube, perhaps they will agree, but for me, you are just a sad little person. The world isn't all about you, when you realise that then you will probably become a better person. Maybe not, but you can but hope. Oh dear, you really don't have a skin for this whole media thing do you? Tell you what, I'll stay away from your future threads as they will all be (as usual) you twisting what other people say to match your world opinion and expecting other people to believe you. Some will, as they will hold the same bias, some won't and you will do as you are doing here to try and defend yourself. The world is full of stupid people, I'd like to make sure I hold conversations with at least one less of them. ETA, although I'm not here for stars, isn't it strange my responses get them and yours don't? You might want to sharpen up your media skills. Brag some like minded people? Does that even make sense? You mean I'm bragging about getting stars? Far from it, I mean't the fact no one appeared to be supporting your responses, I couldn't really care, it just means people disagreed with you. Just please face it, you made a post where you wanted people to support you when you committed copyright theft. You didn't get what you wanted and now are acting like a child. It happens, lots of other people do it. Best thing to do, learn from it. Other companies material is not for you to use as your own without permission, it's not a hard concept, if you come out with something interesting at some point in your life and other people try and steal it then you will possibly feel you are protected. Or should be. “People have the right to use publicly available material to criticize." If it's been placed in the public domain without any restrictions or caveats placed against it, that's correct. If not, then it isn't - that's tough, but it's a fact. Just having an opinion doesn't make you right, having an opinion without having the facts risks you looking like an idiot. Far from it, I mean't the fact no one appeared to be supporting your responses, I couldn't really care, it just means people disagreed with you. Or it means most of us who do see Gramblers arguments have moved on from the thread? 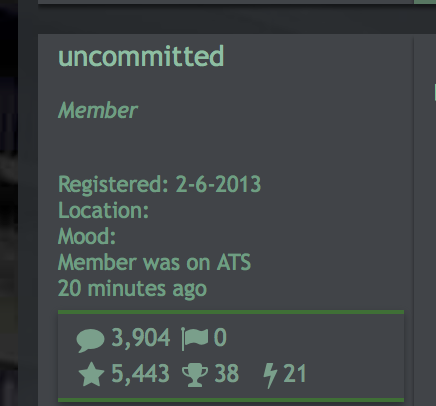 I drop back in and find such disingenuousness from you, uncommitted. Since stars equal won argument is your appeal I do think stars and percentages sometimes tell the story.